The sheer diversity of wildlife species is high indeed which ranges from large to small mammals, bird life, reptiles and insects. This is not to forget the gasping landscape of large sandstone formations of all shapes and sizes mixed with various igneous intrusions and extrusions such as dolerite dykes, basalt overflows adjacent to which we are finding various kinds of metamorphic rock formations. To top all of this, the frequency of previous human habitation is astonishing, boasting grinding stones, arrow sharpening stones, beads which are thought to be linked to the Arab trade routes, stone walls indicating old settlements and new ones built by British and local tribes during the late 18 hundred colonial times. There has been a continuous amount of general game sightings such as countless impala, kudu, high numbers of warthog, klipspringer, common duiker, wildebeest, zebra, large groups of eland (which are now splintering due to rain fall and available water), waterbuck, steenbok and giraffe. On a larger scale, fantastic herds of elephants throughout the reserve as well as in front of camp both during the day and at night. 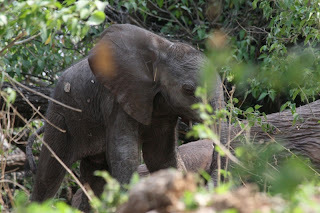 We were blessed by the birth of an elephant calf less than 300 meters up-river from camp which we stumbled upon during a walk. We headed for a safe viewing position to then watch the young calf standing, shakily and walk around her lying down and resting mother. We left before disturbing the delicate scene. We have also come across an aggressive cow that happens to be tuskless – while watching her herd for over 20 minutes, she suddenly decided to turn and gave us a pretty serious warning charge. I managed to stop her charge by shouting, but this was only after she had sprinted over 40 m towards the vehicle. A good lesson was learnt by the learners on how quickly things can go wrong in the wilderness and how to handle such emergency situations. Predators of all sizes have been spotted ranging from a lioness with three, two month old cubs, to a nomadic lioness walking along the marsh edge, a pair of honeybadgers, numerous African wildcat sightings including one mother with her young kitten, black backed jackals, a family group of bat eared foxes with 4 young pups skulking around at night and to top it all, we have found two hyena dens, one close to the camp and another on the eastern side of Mashatu. Birdlife is wonderful especially with the migrant birds returning. The highlights so far are lanner falcon, gymnogene, brown snake eagle, a female pallid harrier, numerous sightings of a pair of black eagles and fish eagles in and around the camp. We have come across leopard and cheetah tracks close to the camp, but no sightings yet.